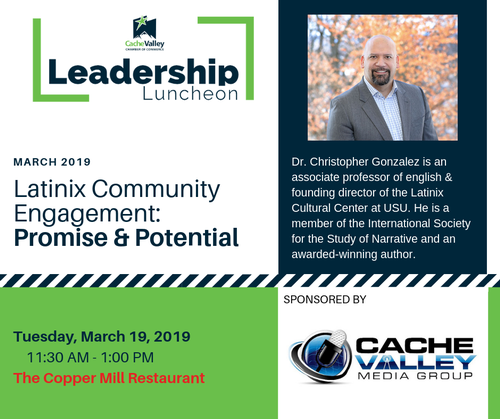 Topic: "Latinx Community Engagement: Promise and Potential"
Learn from Dr. Christopher González, an associate professor of English and the founding director of the Latinx Cultural Center at Utah State University. In 2012 he received his PhD in English from The Ohio State University, where he was a member of the Project Narrative initiative. He is a specialist in marginalized literatures of the United States, cognitive narratology, and graphic narrative, and is a board member of the International Society for the Study of Narrative. He is the author of Reading Junot Díaz (U of Pittsburgh P, 2015), the first book that comprehensively examines Díaz’s body of work through both lenses of narrative theory and cultural studies. His Permissible Narratives: The Promise of Latino/a Literature (Ohio State UP, 2017) received the Honorable Mention for the Perkins Prize, which recognizes “the book that makes the most significant contribution to the study of narrative.” González is editor of the “Narrative Theory and Culture” book series with Routledge and the “World Comics and Graphic Nonfiction” series with the University of Texas Press. González’s most recent thread of scholarship explores the concept of “narrative permissibility”—the affordances and constraints in narrative design with which authors from historically-marginalized communities must contend.